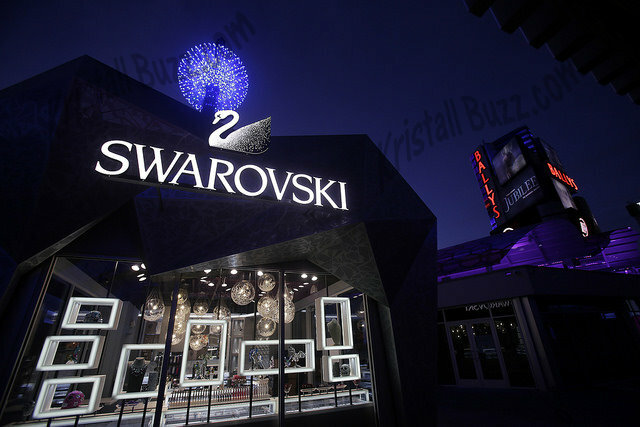 Just this week, the crystal giant has officially launched their Swarovski Midnight Celebration in Las Vegas. It is a spectacular light and sound show, lasting about 3 minutes. Swarovski’s vision in the starburst was that it would create a New Year’s Eve excitement 365 days / year! This unique starburst is the only one in the world. Measuring about 14 feet in diameter, it features 911 custom-cut Swarovski spheres and over 1800 points of LED lights. The light-action show is choreographed to music. 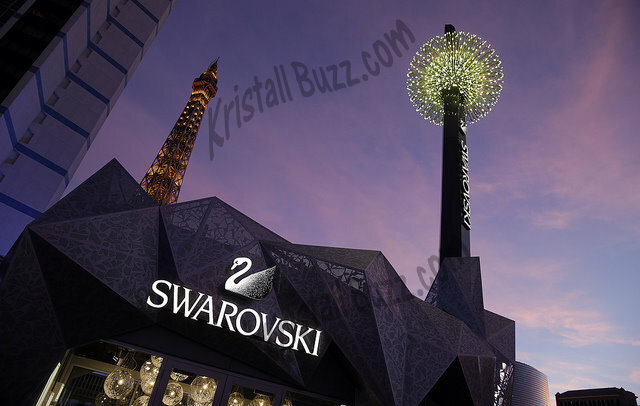 The Swarovski Starburst is located above the 400-foot free-standing pavilion store on the Las Vegas strip. Even the design of the pavilion store architecture was to have the store resemble cut crystal utilizing many angular facets. 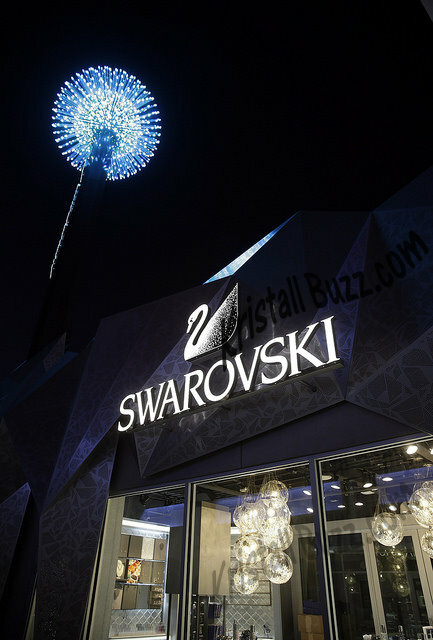 The Grand Bazaar shops, which Swarovski is a part of, opened the outdoor shopping attraction on February 26. Following the motif that bazaar shops allow bartering, there will even be items that shoppers can do some price-negotiating….can you imagine…..bartering at a Swarovski store! The featured items may change daily. Store hours for this location are 9:30am to 12:30am daily. So, whether you want to see the Swarovski Starburst Light Show, visit and barter in the Swarovski shop, or simply have a great time in Las Vegas, this sounds like a must see stop for Swarovski crystal fanatics! It seems that nearly everyone is using fitness trackers these days, measuring their activities as well as their sleep. There are pros and cons to every device ranging from price, accuracy, battery life, and color. I found one that is a definite ‘PRO’ in terms of fashion and bling with a sweet battery life and features a waterproof activity tracker! Yesterday, I saw that Misfit Wearables (a hardware company that designs and manufactures wearable products that utilize sensor technology) and Swarovski have teamed up for some useful, blingy, fashionable fitness trackers! The activity tracker is a fully faceted crystal in a Swarovski exclusive cut, that measures your activities and sleep, and syncs with your smartphone. A battery is included, which from several sites appears to be replaceable and lasts 4 to 8 months. The Swarovski Shine Vio Set, Swarovski Shine Slake Set, and Swarovski Shine Piofioria Set are shown on the Swarovski web site, however, at this time, the pre-order must be done at the Misfit web site. These sets include the actual activity tracker. Prices for the sets are $169 – $249. One article indicated that the sets would be available at Swarovski.com in the spring of 2015. Additionally, pendant and wristband accessories (without the device tracker) can be pre-ordered at the Misfit web site: Serora Pendant, Lisea Pendant, Vio Pendant, Cardoon Leather Wristband, Cleyera Wristband, Piofioria Wristband, and Slake Bracelet (in light gray, medium gray, and black). Prices for the accessories are $69 – $149. And that’s not all…. 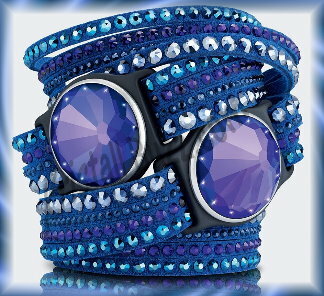 while I was researching for the article, I learned that yet another Swarovski Misfit tracker seem to be on the horizon! I found pictures of a purple stone in a navy or purple slake bracelet. The article with it sites that the purple one (Violet Swarovski Shine) is going to be a solar-powered fitness tracker! The launch date of the Swarovski solar powered activity tracker was not evident anywhere I looked. The Misfit Solutions are shown in their store for pre-order: Swarovski Shine Collection as well as the Swarovski site: Swarovski Activity Tracker. Naturally, Misfit’s apps in Google Play and the Apple App Store allow users to get tracking information on their phone. Seriously….seeing all this makes me want to track my activities just so I can get one! This is exciting new for fitness fanatics and Swarovski crystal fanatics alike! Swarovski Passport to Sparkle…Something fun for Crystal Fanatics! Swarovski is all about innovative ideas to engage crystal fanatics in social media, online experiences, and games on phones and electronic devices. Keeping that in mind, Swarovski US is introducing a new rewards program. It is the Swarovski Passport to Sparkle. Some SCS collectors may have already received “passport” in the mail, while others will need to visit their local Swarovski boutique. Once the Swarovski passport is in hand, you need to register it at the Swarovski boutique. Special events will be going on in the months ahead, and the boutiques have special ‘stamps’ to mark your passport. Good news for participants, the first level of reward is 6 stamps, the second is 10 stamps. Prizes are awarded monthly, with the grand prize a trip to Rio de Janerio. Who wouldn’t want to win that! The crystal giant has created a micro-site to detail the adventure… Swarovski Passport to Sparkle. The home page also lists how to get started, explains the various Jet Setter gifts, and highlights prizes and destinations. There are so many different aspects of the adventure that is well worth your time to visit all the areas of the site. You can follow Emma on her travels in her travel blog, beginning in Paris. Only a limited number of passports were made, so if this peaks your interest…you may want to contact your local Swarovski boutique soon! Best of luck to all Swarovski fanatics getting involved in this contest! Last year we heard rumors of reorganization of the product lines that they classify crystal figures into. Examples of such product lines include Silver Crystal, Crystal Moments, Lovlots, Soulmates, and so forth. But now, in 2013, some of those very well known names are a part of history as new product line names have officially rolled out. 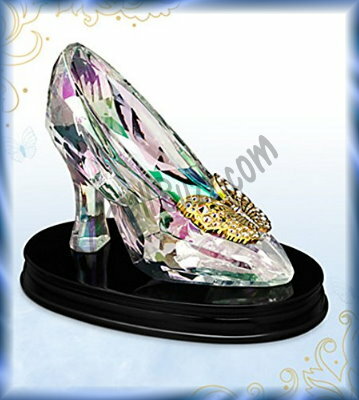 There are 4 main product lines: Swarovski Symbols, Swarovski Characters, Swarovski Nature, and Swarovski Art and Statement. There are further groupings within each of the crystal product lines. What has to be the biggest surprise is the disappearance of the Silver Crystal name that Swarovski has become so famous for, and even trademarked. Silver Crystal is now Crystal Nature. Crystal Paradise has been replaced with Mother Nature. And Soulmates has been replaced with Contemporary Nature. These 3 groups: Swarovski Crystal Nature, Swarovski Mother Nature, and Swarovski Contemporary Nature, comprise the product line Swarovski Nature. Swarovski Characters is a product line that is easier to decipher and understand. 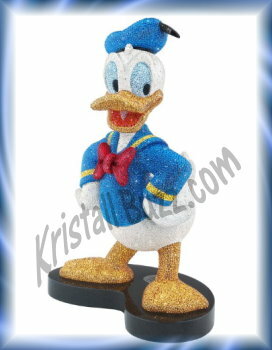 Swarovski Characters consists of: Swarovski Disney figurines, Swarovski Hello Kitty figurines, and all the Swarovski Lovlots figurines. The Lovlots group consists of: Limited Edition Mos, Emotis, Kris Bears, Bo Bears, Happy Ducks, and the families of Lovlots Pioneers, Lovlots Gang of dogs, Lovlots House of Cats, Lovlots City Park, Lovlots Circus, Lovlots Sealife, Lovlots Birds on Broadway, and new in 2013, the Lovlots Dinosaurs and Lovlots Erika and Elliot. Swarovski Symbols seems to be more of a catch-all group for the balance of the more affordable crystal offerings. The symbols group features 3 groups that seem fairly self explanatory: Universal Symbols (formerly known as crystal moments), Seasonal Symbols (where it seems Swarovski is going to separate offerings that go with spring/Easter, and Christmas), and lastly Asian Symbols (for ornaments and zodiac figurines). Swarovski Art & Statement to me, simply means things I cannot afford! The only group in this product line is crystal myriad. Swarovski is also using this group for other numbered limited editions. Swarovski discusses this more in the SCS member magazine that has been recently arriving in mailboxes. The article is on pages 30-31 in ‘ask Ann-Sophie’. Part of me is wondering if Swarovski is dropping the term ‘Silver Crystal’ due to the change of Swarovski’s new formula….no lead, no silver? Or perhaps that was just a coincidence? 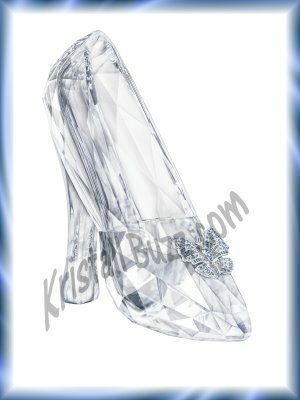 So, prepare yourself for changes within publications, web sites, or software to see how they may deal with the changes in the Swarovski product lines! 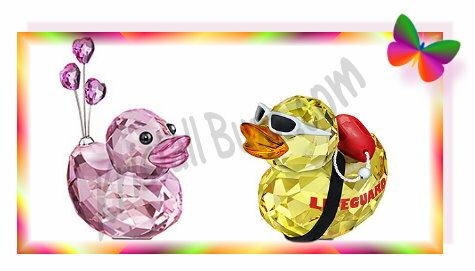 Swarovski has added yet 2 more ducks to the Lovlots Happy Ducks group: Swarovski Lifeguard Duck and Swarovski Sweetheart Duck! Swarovski Lifeguard Duck is a yellow duck (like Sunny Sam and Sunny Steve), accessorized with white shades (sunglasses), a miniature lifeguard float strapped to him, and LIFEGUARD painted on the side of the duck. Swarovski identifies this Lovlots figurine with system # 1143443. Verena Castelein is credited with the cute duck design. The MSRP is $130. Swarovski Sweetheart Duck is a pink duck with some heart-shaped decorations attached above the tail area. Swarovski identifies this Lovlots figurine with system # 1143438. Verena Castelein is credited with the cute duck design. The MSRP is $80. For a complete list of the Happy Ducks, this information can be found on the Swarovski Lovlots page of Crystal Exchange America site. Collectors who are Happy Duck Hunting can find the retired Lovlots Happy Ducks in the Lovlots and Zodiac category of the Crystal Exchange America store. 2013 has already welcomed a plethora of new product on the crystal giant’s own web site. However, crystal collectors appreciate it more when the new figurines are limited edition designs. 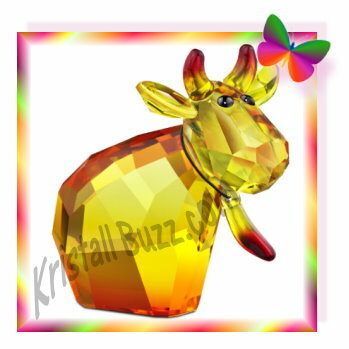 One such new product is the Swarovski Limited Edition Kris Bear. 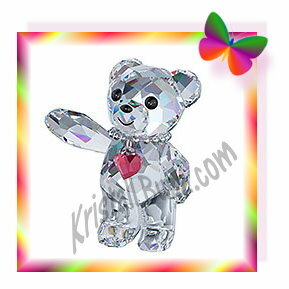 This Swarovski Kris Bear was created to celebrate the 20th anniversary of the Kris Bear figurine. This new figurine is about 1.5″ tall and retails for $100. Swarovski identifies it with system #1143456. They provide credit for the design to Keiko Arai. Kris Bear sports a special pink heart necklace and the bear has “2013” engraved on the foot. The next 40 Kris Bear figurines were launched 2005 to present day. 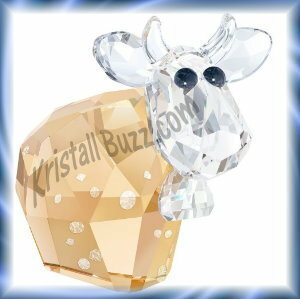 In 2008, Swarovski began incorporating Kris Bear into Christmas ornaments, promoting annual edition Kris Bear Ornaments. (As of 2012, Swarovski continues this trend.) Other Swarovski Limited Edition Kris Bears include: Santa Kris Bear in 2006 and Halloween Kris Bear in 2011. And we could probably go on and on with all the different ones! In 2012, Swarovski moved the Kris Bear family of figurines into the Swarovski Lovlots group. If you are looking for any of the retired or discontinued Kris Bear Figurines, look at the Crystal Exchange America site in the Lovlots and Zodiac category of the store. Kris Bear Ornaments can be found in the Christmas & Ornaments category of the store. Swarovski Flower Power to the Bunnies in 2013! 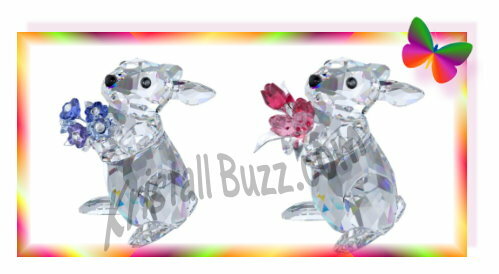 The crystal has released two new bunny rabbits, each holding a bouquet of flowers…. The rabbit with the flowers are in the Seasonal Symbols product line, in the theme of Spring. Both the bunny figurines were designed by Heinz Tabertshofer and retail for $160 each. Swarovski Rabbit with Forget-Me-Not: This cute creation makes an ideal gift for Mother’s Day, Easter, or any other occasion! Crafted in clear crystal, the rabbit holds a bunch of forget-me-nots in Sapphire and Light Sapphire crystal with silver-tone metal stems. An Aurora Boreale crystal chaton sparkles at the center of each flower. Swarovski Rabbit with Tulips: This adorable clear crystal rabbit holds a bunch of tulips in Indian Pink and Light Rose crystal with silver-tone metal stems. Cute and colorful, this charming design makes an ideal gift for Mother’s Day, Easter, or any other occasion! The crystal giant has retired another bunny rabbit with flowers, the Swarovski Rabbit with Poinsettia. This rabbit figurine has recently sold out at the Swarovski online shoppe, where it was priced at 50% off. In 2012, the crystal giant introduced the Bo Bear figurines into the Swarovski Lovlots collection. Four hip teddies joined several other groups in the growing Lovlots community of personality-filled characters. Swarovski Bo Bear – Heavy Metal (reminds me of “N the Skull”), retiring in 2013. Swarovski Bo Bear – So Sweet, retiring in 2013. Swarovski Bo Bear – So Brilliant, retired in 2012 and is now 50% off at the Swarovski shoppe! Swarovski Bo Bear – Blues Bo. This way cool bo is lavender with some gold bling and a purple baseball hat. 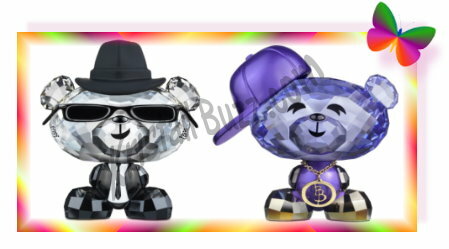 Swarovski Bo Bear – Hip-Hop Bo. This way cool bo is dressed in black, sporting his shades, a tie, and black hat. All six of the Swarovski Bo Bear figurines were designed by Peter Heidegger. And all six characters retail in the price range of $150 to $160. Here are Swarovski’s official product descriptions for the 2013 Bo Bear introductions. Lovlots Hip Hop Bo Bear – Hip hop is my life! Hip-hop Bo spends most of his time busting rhymes. His head shines in Provence Lavender crystal with a lacquered violet body and Crystal Metallic Light Gold arms and feet. He wears a cap in plastic material and golden necklace both featuring the BB logo. Not intended for children 15 and under. The Bo Bear comes with a unique metal tag that can be used as a key chain or bag charm. Lovlots Blues Bo Bear – I am too cool for school! This funky character shines in Crystal Silvershade with Jet Hematite crystal arms and feet. He wears metal sunglasses and a lacquered suit, and a hat in a black plastic material. Not intended for children 15 and under. The Bo Bear comes with a unique metal tag that can be used as a key chain or bag charm. I’m looking forward to seeing where the crystal brand goes with this collection of Swarovski bears. Will they continue to grow? 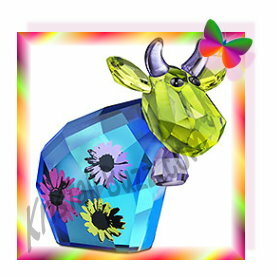 Or will Swarovski collectors not really latch on to this line of animals? Only time will tell! Crystal Exchange America has an up-to-date page on the Swarovski Lovlots for collectors looking for a summary of the figurines in the community. In 2013, Swarovski is making some changes to the Hello Kitty lineup. There are a couple new kitties on the catwalk, and several other kitties are taking the exit ramp. The Swarovski Hello Kitty 2013 introductions have a slightly lower price point than the original lineup from 2011….$150 (for the 2013 cats) vs $205 (original cat figurines), so that should be great news for our pocket books! So, three Swarovski Cat Hello Kitty figurines remains yet unmentioned…. Swarovski Hello Kitty Gold Bow – This feline friend was added to the lineup in 2012, so she is still relatively new to the kitty cat group. Swarovski Hello Kitty Santa – A festive Hello Kitty that is sort of “out-of-season” at this point. Swarovski Hello Kitty Hearts – This kitty was a limited edition in 2012 and can no longer be purchased in the online shoppe. For collectors who may have missed out, the Hello Kitty Hearts Limited Edition can be found at the Crystal Exchange America web site in the Hello Kitty category. 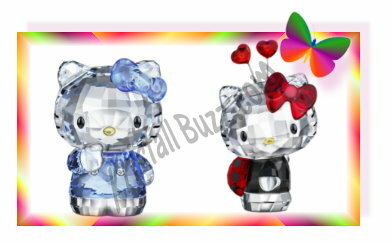 So let’s give the nice new Swarovski Hello Kitty crystal figurines a warm welcome to Swarovski Cat clan! The Swarovski Lovlots showcase is showing some colorful new characters…the most noticeable being the new Swarovski Dinosaurs! The five crystal dinosaurs are definitely out of the ordinary. In Swarovski trends from past years, there has been a limited edition for the new group. As none of these dinosaurs are identified as limited editions, I’m wondering if there is yet another Swarovski Dinosaur to be released yet in 2013? Swarovski Dino 7550 000 010 / 268 204. Available 2002 through 2005 from Swarovski. Swarovski Lovlots Jay D. Dino – 9400 000 052 / 832 181. Available 2006 through 2007 from Swarovski. 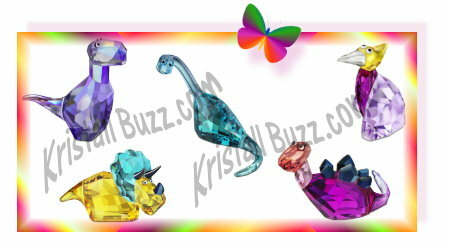 So cheers to Swarovski’s newest characters representing the enormous, extinct reptiles of the earth!